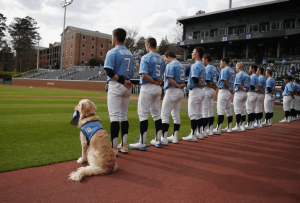 The UNC Baseball team is pictured with their training room assistance dog, Remington (UNC Chapel Hill). Although temperatures are still chilly in Chapel Hill, baseball season is just around the corner. The Diamond Heels will start their’s next week in sunny Tampa as they take on USF. Carolina is unanimously considered a preseason top ten team and they’re looking to shake off their poor ending to last season.